The decimal number system that we used everyday contains ten digits, 0 through 9 and the base of this system is 10. There is another very important number system known as Binary Number System which contains only two digits, 0 and 1. So the base of binary number system is 2. To avoid confusion while using different numeral systems, the base of each individual number may be specified by writing it as subscript of the number. For example, the decimal number 156 will be written as 15610. The binary number 10011100 will be specified as 100111002. Note : There is no 2 in base 2. A binary number 11001 (base 2) can be converted into decimal number (base 10) using the method explained below. 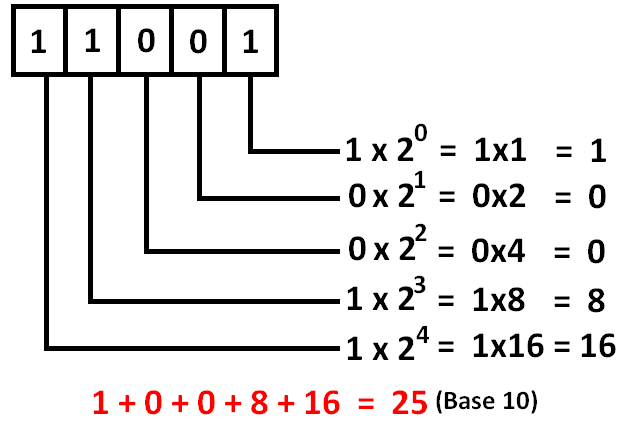 A decimal number 35 (base 10) can be converted into binary number (base 2) using the method explained below. 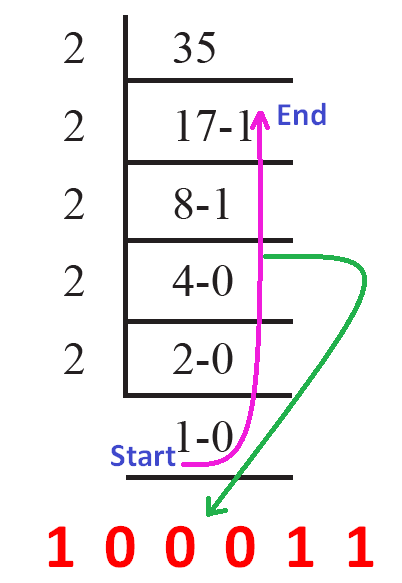 Since the binary number has the base 2, we go on dividing by 2 and get the remainder. Therefore, the decimal number 35 (base 10) is equal to the binary number 100011 (base 2). Do you want to check your answer fro the questions like "Decimal to binary" or "Binary to decimal" ? Please click on the following links to get answer instantly for your questions. The Binary Number System plays a central role in how information of all kinds is stored on computers. Almost all packaged goods we buy today are marked with Universal Product Code (UPC). An Optical scanner ‘reads’ the patterns of black and white, thick and thin and converts it to a binary code that is sent to the scanner’s computer, which then calls up the appropriate product name, price, etc.,. On a compact disc (CD), music is digitally encoded on the underside of the disc in a binary system of pits and “lands’ (non – pits). If a CD is played, a laser beam traverses along the spiral and is reflected when it hits a land, but it is not reflected by the pits. It is these changes that return binary date. A change is recorded as a 1, and no change is recorded as a 0. The binary sequence is then converted into music. After having gone through the stuff given above, we hope that the students would have understood "Binary numbers". Apart from the stuff given on the web page, if you need any other stuff in math, please use our google custom search here.